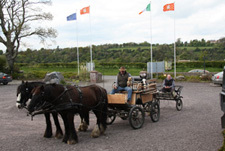 Tailored tours of the Boyne Valley with Boyne Valley Horse and Carriage Tours. Individual and group tours to the nearby sites of Newgrange, Battle of the Boyne Estate, historic Slane Village, Mellifont Abbey and Monasterboice can be arranged. Or go on a Mystery tour including lunch and other refreshments!